Another outfit from New York Fashion Week, I wore this on Friday to the Lulu Frost preview, Kate Spade presentation, Mischa Nonoo’s runway show and a bunch of meetings. As I mentioned in my post on Wednesday, dark winter shades get really old, really fast, so I decided to spice up my fashion week wardrobe with some pastels and lighter pieces. While I couldn’t go without a coat or tights (it was 19 degrees, people! 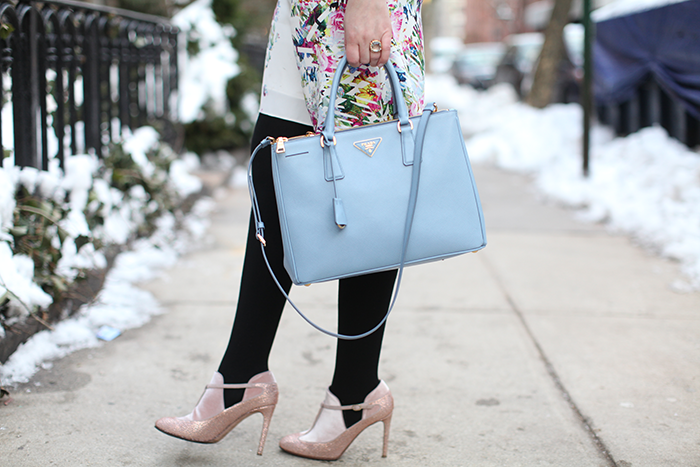 ), I felt my pastel pieces softened up the outerwear. 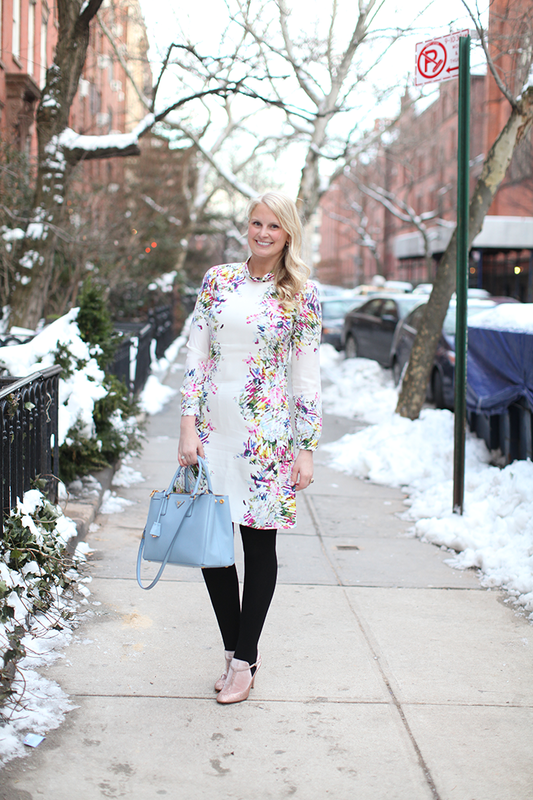 Another great example of how to wear spring pieces now! I’m constantly doing this as I have no sense of delayed gratification. Anyone else? Stay tuned later today and this weekend for more snaps from my favorite fashion week shows and events – hope you all have a great weekend! I love that bag so much, the color is perfect. Dark colors are definitely a drab after a while. 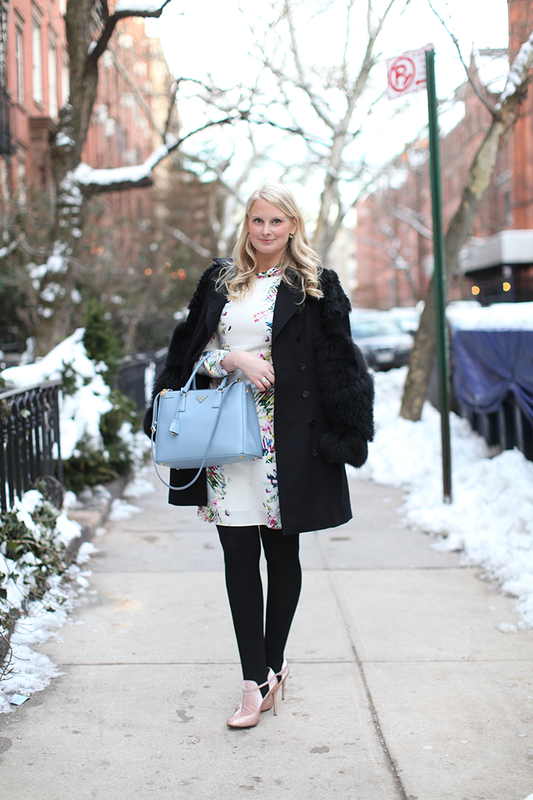 You brightened up winter in a chic yet functional way. BTW I’m dying over that purse. Absolutely gorgeous! The print of this dress is so pretty and I love the color of your bag!! Snowy NYC! Love this fun look! Happy Friday! that prada bag is amazinggggg. Erdem is just amazing, this dress is just impossibly pretty! have a great weekend ! That Prada bag is everythingggggg! LOVE the white dress on a cold day! That bag is amazing…such a gorgeous color! You officially have the closet I covet the most. Gorgeous EVERYTHING! Love, love this dress! I am such a sucker for long-sleeve sheath dresses and the pattern on this is fantastic! We will have to meet up next time you are in NYC! Have a great weekend. I love your dress…can I borrow? j/k Have a great weekend! Beautiful look, Merritt. I love the dress and it’s so beautiful with your blue Prada. I was in Neiman’s last week and came face to face with a Balenciaga city in a similar color with silver hardware. I love Balenciaga. I think it might have to come home with me next time I’m in! P.S. Loving the Lela Rose runway photos. So many beautiful pieces! What a fun dress! It’ll be great for Spring too! 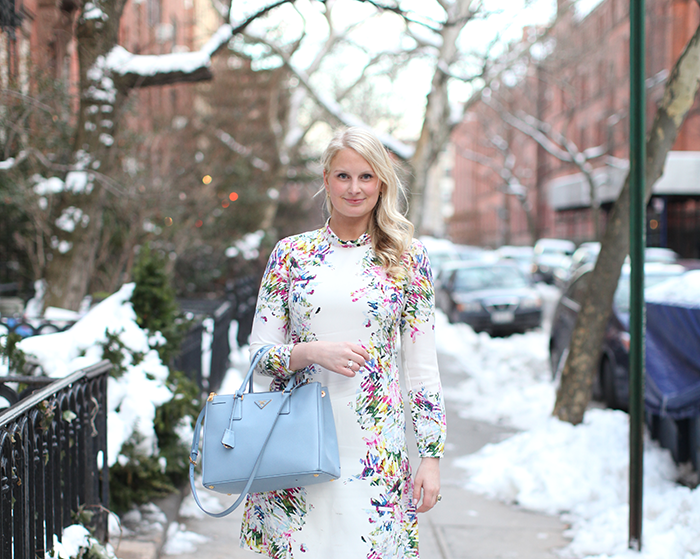 Beyond obsess with your dress so perfect for both winter and spring! That bag is insane! Love the powder blue color. Beautiful photos – you look gorgeous!